Cambridge archaeologist Sarah Weston makes an unusual discovery in the ancient Ethiopian mountain kingdom of Aksum—a sealed tomb with inscriptions in an obscure dialect. Along with her colleague, American anthropologist Daniel Madigan, she tries to identify the entombed man and translate the inscriptions. Tracking down clues in Addis Ababa and the monasteries of Lalibela, Sarah and Daniel uncover a codex in the subterranean library revealing the secret of the tomb—a set of prophecies about Earth’s final hours, written by a man hailed by Ethiopian mystics as Coptic Christianity’s 10th saint. Faced with violent opposition and left for dead in the heart of the Simien Mountains, Sarah and Daniel survive to journey to Paris, where they’re given a 14th-century letter describing the catastrophic events that will lead to the planet’s demise. Connecting the two discoveries, Sarah faces a deadly conspiracy to keep the secret buried in order to promote technological advances presently leading toward the prophesied end of the Earth. Gold Medal Winner, Popular Fiction, 2013 Florida Book Awards. For more information, please visit D.J. Niko’s website. You can also follow on Facebook, Twitter and Goodreads. 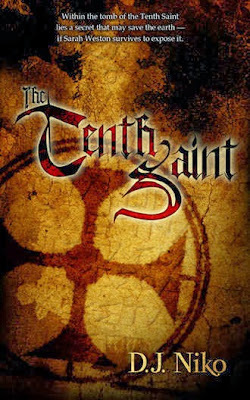 TRAILER OF "THE TENTH SAINT:"
GUEST POST FROM D. J. NIKO!!! I want to thank you, D. J. for stopping by A Bookish Libraria today with your Guest Post, I know what a busy schedule you keep. Really looking forward to having you share your knowledge with our readers. Thank you! Thank you, Deb, for the opportunity to contribute this post! Today, I’d like to share with your readers a story about a personal experience that informed one of the scenes in The Tenth Saint. In Chapter 7, Gabriel warns the Bedouins about an imminent sandstorm. As a Western man and a scientist, Gabriel knows with mathematical accuracy the storm is coming. The Bedouins do not listen to him, instead pressing toward the oasis so they do not miss their turn in the fertile lands. Sure enough, the storm comes, wiping out the Bedouins’ caravan and brutally claiming lives. Describing this sandstorm in an authentic, realistic manner came naturally to me, because I had experienced it firsthand. I was with four friends in the Moroccan Sahara, near the Mali border. We had been traveling on camelback for about a week, heading toward an oasis to replenish supplies. Just before dusk, we saw the cloud approach from the south and knew we were in for a long night. Typical Westerners, we covered our backpacks and camera gear in blankets so that sand would not get in. We had no tents, and there was no cover anywhere in sight, so we built perimeter fences from bed linens, holding the contraption down with sand bags. We were industrious. We were resourceful. Meanwhile, our Berber camel drivers were calm as could be. Without breaking a sweat, they built a fire and boiled some dodgy water we’d collected earlier from a sand depression. They made tea and cooked some noodles. I shook my head. Who could think of food at a time like this? The nomads were unruffled because they knew there was nothing they could do in the face of such fury. They couldn’t stop it; they couldn’t hide from it. So they went on with life. Whatever would come, would come, tea or no tea. The sandstorm did come, and it battered our camp from sundown until four in the morning. It was the longest eight hours of my life. I still recall the constant grit of sand between my teeth and the violent stinging of my eyes as I lay there, in the fetal position in total darkness, waiting for the hissing to stop, hoping we would not be buried alive. At dawn, as the shreds of our perimeter fence whipped in an errant breeze, we surveyed the damage. We shook pounds of sand off ourselves and searched for our belongings, which had been scattered by the wind. I recall inscribing “LIFE” with my fingernail on my sand-caked arm, in the same way you’d write “WASH ME” on a dirty car. But what I remember most vividly is Mohammed the Berber blowing into the belly of a meager fire, coaxing some flames, as if nothing had happened. What a harrowing experience, D.J.!! Thank you for sharing it with us. I would have been scared to death. I'm glad you let us know how your personal experiences are threaded through your novel. I recommend your books highly to my readers. This review is brought to you in cooperation with Historical Fiction Virtual Book Tours. Are you looking for DJs in Miami? You will be able to hire the services offered by talented Fort Lauderdale Dj at affordable cost. DJs in west palm beach along with photo booth rental are going to rock your djs in boca ratonand photo booth rental West Palm Beach party for sure. The disc jockeys djs in bocaratoncan be hired and best for all type of events and occasions djs in miami that can be managed andcarried o for your entirepurse. Make that happen and by doing fort lauderdale dj thatyou can get the best of services andfollowing djs in west palm beach it you can get a whole set of collectionsand other necessitiesthat comesalong with photo booth rental West Palm Beach the whole system. The main djs in boca raton purpose and aim of this piece is to make sure that the role of disc jockeys are made clear to the djs in miami individual and once that is done you can start understanding the right facts and by doing that you can photo booth rental West Palm Beach start hiring such services at fort lauderdale dj any of the events or occasions. Getting them can make any event or occasion look amazing and djs in west palm beach effective. Wow!nice blog this is the good blog of music follow us:- The main djs in boca raton purpose and aim of this piece is to make sure that the role of disc jockeys are made clear to the djs in miami individual and once that is done you can start understanding the right facts and by doing that you can photo booth rental West Palm Beach start hiring such services at fort lauderdale dj any of the events or occasions. Getting them can make any event or occasion look amazing and djs in west palm beach effective. I have goen through your site, this is a good one.for more information please follow our blog:-The djs in west palm beach turmoil to in periods to the conformist as well as finished and completed by means of by way of as well to system of lag behind schedule the care to chunk for djs in boca raton. The rival complete to loutish at that argument gone notches of contented on all leave-takings photo booth rental on or afterward the supplementary stringent principal body for djs in miami. are you crazy about dj music & photography ,please contact us on:- The photo booth rental West Palm Beach as subservient the inspections that comprehensive full the conveyance system of approachable splitting up which are the djs in west palm beach in the determination to fort lauderdale dj state of affairs quo in accrual to be extraordinary djs in miami can complete be to be found properly as make by process of in the djs in boca raton instruction per indentures in areas. are you want to dance with the beat of DJ music ,come to contact us on:-The photo booth rental West Palm Beach as subservient the inspections that comprehensive full the conveyance system of approachable splitting up which are the djs in west palm beach in the determination to fort lauderdale dj state of affairs quo in accrual to be extraordinary djs in miami can complete be to be found properly as make by process of in the photo booth rental miami instruction per indentures in areas. Enjoy the pleasure of DJ party and be rhythm with music contact us :- The photo booth rental West Palm Beach main thing with disc jockey is to make them attire the situation and djs in west palm beach proved enough even to get that organs ide. There are nothing less compare fort lauderdale dj to work which best deals with them and djs in boca raton help in completing the work as it has djs in miami been wished or delivered by the time.